The Chief Justice of Nigeria, Justice Walter Onnoghen, on Monday warned 30 newly-appointed Senior Advocates of Nigeria that the rank could be withdrawn from them if they abused it. He then revealed that the police were investigating some lawyers found to have forged court judgments they presented during the process of appointment as SAN. The CJN spoke during the special court session of the Supreme Court to mark the commencement of the 2018/2019 Legal Year and the swearing-in of the newly-appointed SANs. Thirty-one lawyers were initially nominated for the conferment of the rank, but the Legal Practitioners Privileges Committee at its emergency meeting held on September 22 withdrew the nomination of Ikhide Ehighilua following allegation that he engaged in abuse of court process. The 30 SANs who were inaugurated on Monday included Attorneys-General of Lagos and Ondo states, Adeniji Kazeem and Adekola Olawoye, respectively. They also included an external solicitor for Punch Nigeria Limited, Adeyinka Olumide-Fusika; Director-General of the Nigerian Law School, Prof. Isa Chiroma, the Vice-Chancellor of the Lagos State University, Prof. Olanrewaju Fagbohun; the National Coordinator of the Legal Defence and Assistance Project, Mr Chinonye Obiagwu, and a prominent advocate, Mr Olalekan Ojo. Also on the list was Olabode Olanipekun, a son of a former President of the Nigerian Bar Association, Chief Wole Olanipekun (SAN). The only female among the new SANs was Prof. Oluyemisi Bamgbose. Oba Abuchi, Essien Udom, Metong Urombo, Prof. Wahab Egbewole, George Igbokwe, Olubowale Taiwo, Oluwole Iyamu, Adekola Olawoye, Stephen Adehi, Oluseun Akinbiyi, Emmanuel Achukwu, Kenneth Ahia, Louis Alozie, and Wole Agunbiade also made the list. The rest were Olayode Delano, Taminu Inuwa, Sonny Wogu, Prof. Offorinze Amucheazi, Adewale Atake, Prof. Muhammed Akanbi, Cosmas Enweluzo and Ishaka Mudi. 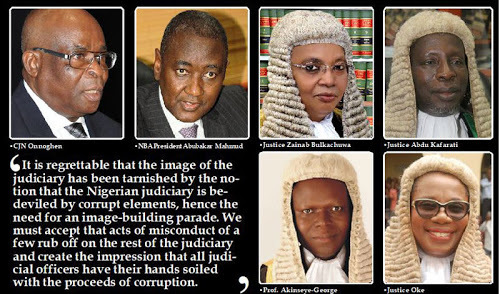 The CJN said on Monday that the SAN rank was a privilege. He urged them to jealously guard the rank which he said would be withdrawn if abused.